Videos require Windows Media Player to play. You can download it for free. Full interviews with the following persons are available for research purposes. They can be consulted on site or a copy can be purchased for $20. plus shipping. 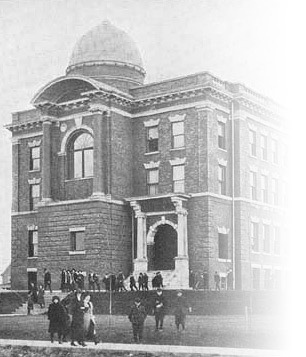 The North Bay Normal School opened in North Bay in 1909. Later the North Bay Teachers' College, it is now the Faculty of Education at Nipissing University. The students of both the Normal School and the Teachers' College produced an annual year book which provides a fascinating glimpse into the life of the students while in North Bay as well as into the world events such as the depression and the world wars which formed the backdrop to their education. Many of the former teachers who were educated at the North Bay Normal School are still alive, living across the country. This project had two major goals. The first was to collect information about the students who attended the Normal School. Reunions organized by the Alumnae Association provided us with the opportunity to interview some former students and to collect pictures and other memorabilia of their year in North Bay in an electronic format. The second goal was to digitize the yearbooks of the NBNS and to make them available to researchers. Since the names of the graduating class are included in the year books this will be an important resource for geneologists as well as historians. The yearbooks have all been scanned and can be consulted as pdf files using the links below. The students who attended with the year and their place of origin have been indexed. That index can be searched using the search bar opposite. Once you have the year of the person you are looking for, you may consult the relevant pdf file to see what information on them appears in the yearbook.